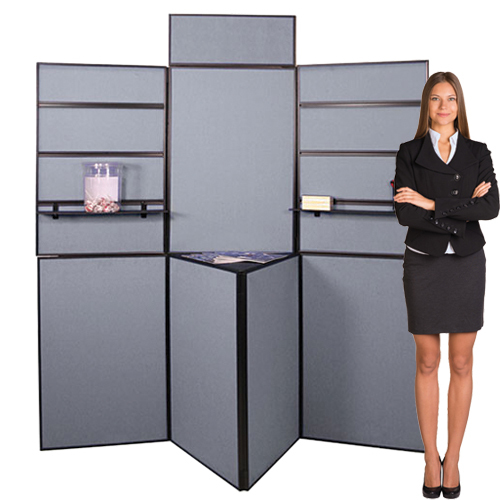 This 7 panel display includes a 2 foot top header, a table top center for a lap top computer, brochures, or for your coffee. All 7 panels come covered with colored fabric. The fabric covering makes it fast to display graphics. You simply apply velcro tape to the back of your picture graphics and you hang them quickly and effortlessly. This complete display system will have you up and running in a matter of minutes, it's quick and easy. This fast but professional display will enable you to make a great impression on trade show visitors. Header Panel: 23.5"w x 10"